WEST LAFAYETTE, Indiana, July 12, 2011 (ENS) – Apple growers are learning the hard way that some of the most commonly used fungicides are no longer effective at controlling apple scab, finds new research from Purdue University. Janna Beckerman, an associate professor of botany and plant pathology at Purdue, said that extensive, long-term use of four popular fungicides has led to resistances in apples in Indiana and Michigan, the focus of her study. Apple scab, caused by the fungus Venturia inaequalis, destroys apples, causing brown lesions on leaves and fruit. A single lesion can reduce an apple’s value by 85 percent. 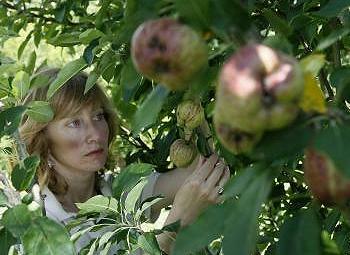 Over time, the scabby lesion will crack and allow insects, other fungi and bacteria inside, causing loss of the crop. Scientists have believed that when organisms adapt to form resistance, that change will weaken the organism in some other way. Beckerman said her study, done with Purdue graduate student Kim Chapman and Michigan State University professor George Sundin, showed that on the contrary, apple scab is becoming resistant to fungicides with no apparent fitness penalty to itself. “Having these multiple resistances to fungicides doesn’t debilitate them in any way,” Beckerman said. Apple scab samples were treated with dodine, kresoxim-methyl, myclobutanil or thiophanate-methyl. About 12 percent of the apple scab samples tested demonstrated resistance to all four fungicides. The only option apple growers have, Beckerman said, is to use older fungicides that are tightly regulated, require more frequent application and are more expensive. Beckerman said she and her collaborators will work to develop faster tests for fungicide resistance in apple scab to help growers change their management plans in a timely manner. The U.S. Department of Agriculture, Purdue University and the Michigan Agricultural Experiment Station funded the research.